Soil Testing McGough's Inc. Soil Testing – McGough's Inc.
Unsure about what to use when fertilizing? When it should be done? How much should be applied? Consider the benefits of testing your soil at McGough’s. 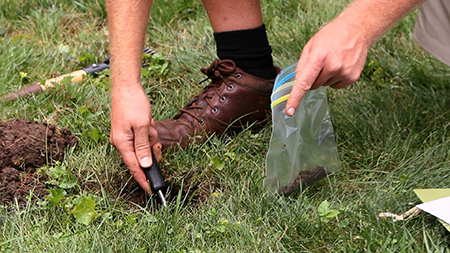 Not only do you receive a clear picture of your soil profile, enabling you to better understand which plants will thrive in that environment, but you also remove the guesswork out of fertilizing. By knowing exactly what your plants need, the best time to use it, and correct rate of application, you reduce unnecessary additives to the soil – which helps not only the environment, but also your wallet. McGough’s offers soil testing through the labs of Spectrum Analytic. With a comprehensive analysis of the soil profile, we can recommend amendments to correct nutrient deficiencies, adjust pH problems, and help you gear your fertilization program to your job site, personal lawn, crops, and gardens. An explanation of how to take a good soil test. Please complete and return with your soil (copies also available in store). One of the most common misconceptions for this area is the need for lime. While in some cases lime is needed, much of the time it isn’t, and excessive application can cause serious long-term problems. Misinformation abounds when it comes to grubs and how to get rid of them. Our brochure explains the available products and when they should be applied. Don’t be fooled into mistiming your crabgrass prevention application. Use the right product for your conditions – at the right time. Our natural products for lawn and garden, including fertilizers, soils, and soil amendments. Organic options are readily available for insect and disease control in vegetables, ornamental plants, turf, and houseplants.